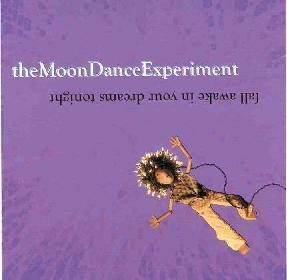 The MoonDance Experiment - "Fall Awake In Your Dreams Tonight"
From Columbus, OH, The MoonDance Experiment plays hypnotic, lyrically intense psychedelia that is structured but exploratory; both floating and intense. The band is a trio and consists of Nicholas Alexander Barger on organ and percussion, Scott Parsons on guitar and percussion, and North Turner on vocals and percussion. Each of the three is also credited with playing "much more". There are 14 tracks on this disc though they transition smoothly from one to the other and have such clear continuity that I didn't even bother noting individual songs. Piano, organ, and synths are the key instruments along with percussion. Note that each member is credited with percussion and indeed the music is percussion-heavy in spots, being wildly tribal at its most intense. The music includes gorgeously lulling piano and organ along with LOTS of varied freaky sounds. Even when the percussion is pounding away madly the accompanying music remains melodic and serene. North Turner's vocals are usually floating but can also become aggressive and even screaming. Turner can sing in a haunting melodic style but also uses a monologue style as well. In summary, this is a marvelous example of mind expanding psychedelia, though not in the acid rock sense at all. The MoonDance Experiment have succeeded in creating something different that all psych fans should enjoy.